Petechiae are tiny and flat red spots that appear on the skin. These round spots appear due to bleeding in capillaries. The spots can also be purple or brown. The spots appear in clusters and appear as a rash. The lesions are non-blanching, i.e. they don’t turn pale when you apply pressure on them. It is a characteristic sign of petechiae. The spots aren’t’ itchy either and they often appear on children’s face, arms, stomach, chest, buttocks, and feet. 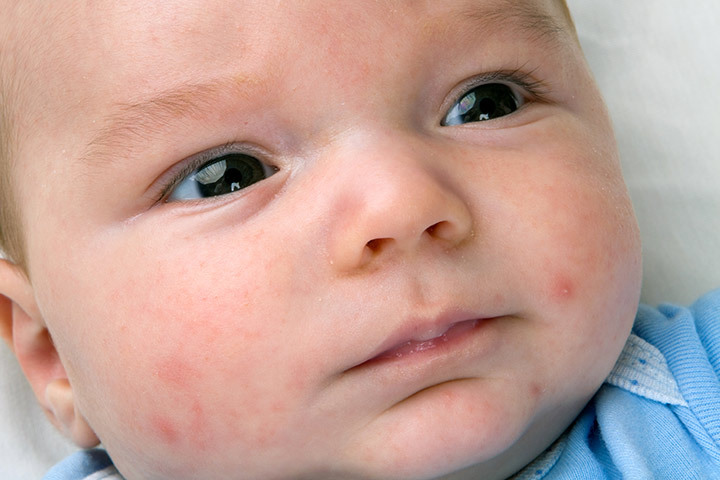 The major symptom of baby Petechiae is the appearance of pinprick sized spots under the skin (purpura). The spots are flat and don’t itch or blanch (turn pale) when you press them. Petechiae spots are usually recognizable due to their characteristic size and color. But the doctor may perform a pressure test to confirm the diagnosis. If the spots do not turn pale, they may be due to Petechiae. The doctor may do a blood test or a series of tests to confirm the cause of Petechiae. Petechiae usually fade away without leaving any scars. But it is important that you consult a doctor if you notice red spots appearing under your child’s skin. Medical intervention for Petechiae is necessary as it is important to find out the underlying cause of the condition. If the cause is a serious illness, any delay in medical attention could be dangerous for him. After initial consultation for Petechiae, follow any treatment plan the doctor suggests. Keep monitoring the spots for any changes in their numbers or color. If you notice any changes in Petechiae spots, inform the doctor about it. Also, seek immediate medical attention for the following. If your child has a high fever (more than 100.4°F). If you notice unexplained bruising on your baby’s skin. If your baby is showing signs of lethargy. If your child has an abnormal pulse. If you notice an increase in the size of the spots. There is no vaccine available for Petechiae in newborns. Since the cause of Petechiae can be any medical condition, you may vaccinate your child for a specific disease. For instance, you can give your child Hib vaccine for meningitis. You can also take care of his diet to prevent Petechiae that can occur due to diseases like scurvy. Scurvy occurs due to vitamin C deficiency so ask your doctor for diet suggestions once he is old enough (4 to 6 months) to consume solid foods. If he spends time in childcare or you have hired help for childcare when you have to be away from home, make sure he is not suffering from any physical abuse in your absence that may be causing Petechiae on his body. Petechiae are not a cause of worry. But the underlying cause of the condition is something parents need to know for the proper treatment of the child. If ignored, the cause of Petechiae could lead to serious medical complications for your child. Did your child suffer from Petechiae? How did you handle his treatment plan? Please share your experience with us.